Are Plastic Baby Bottles and Sippy Cups Safe for Babies? Home » 🍼Feeding & Nursing » Are Plastic Baby Bottles and Sippy Cups Safe for Babies? One of the most common questions that come up from new parents is whether or not baby bottles and sippy cups made from plastic are safe for babies. The short answer, yes they are as long as they’re BPA free. Well, it stands for Bisphenol A that is an industrial chemical. Starting in the 1960s, manufacturers started using it to construct certain plastics and resins. These plastics and resins are commonly used in the production of a variety of food and beverage containers such as, you guessed it, baby bottles, sippy cups, water bottles, measuring cups, and bottle tops. At first, people thought it was safe to drink from cups and containers that have BPA in them, however, it was eventually discovered that BPA can, in fact, seep into both liquid and food stored in containers made from BPA. The problem with that is there are possible health problems caused by BPA including affecting the brain and its functions, behaviors, and there have even been issues related to the prostate gland. The Food and Drug Administration has come out and said that it’s okay if people are exposed to very low levels of BPA. However, if this is something you’re not comfortable with, then the smart thing to do would be to limit how much you expose your baby to BPA. This is actually pretty easy to do since there are many, many companies who make BPA free plastic baby bottles and sippy cups. Note, when you are looking for the best baby food maker, make sure it’s BPA free too. 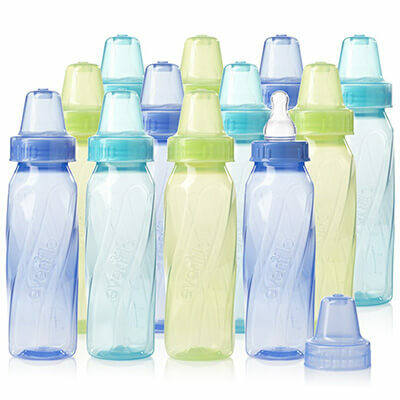 For example, you can get BPA-free and phthalate-free bottles in all sizes from Green To Grow. Or, you can get a natural nurser from Adiri, an aluminum single sheet crafted bottle from SIGG, and old fashioned glass bottle made by Babylife. What’s nice is that these are just a few of the companies that manufacture BPA free products. A few others include Born Free, ThinkBaby, Medela, and Thermos. To find more, simply hit the Internet and browse everything that’s available online. In the end, if you want to do everything that you can to protect your baby, then take the initiative and don’t give him or her a bottle or sippy cup made from plastic that is not BPA free. It might seem like a very extreme thing to do, however, you can never be too safe when raising your child.